NZDUSD is climbing the ascendant channel creating higher highs and higher lows. Today it started its pullback. 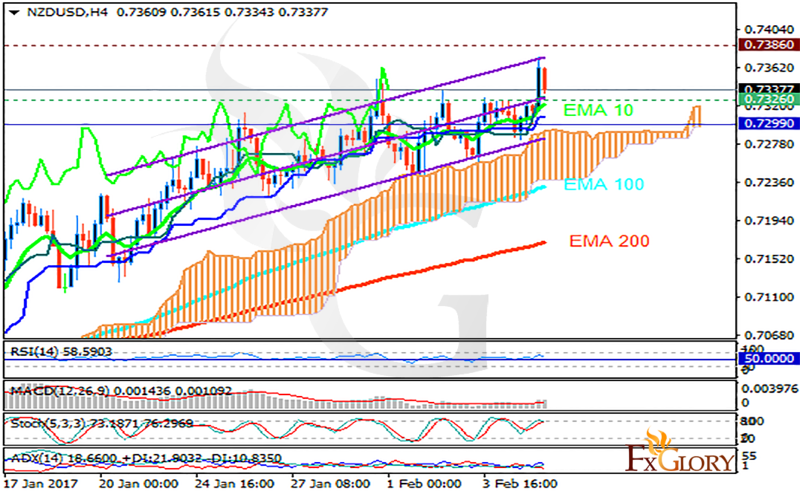 The support rests in 0.73260 with resistance at 0.73860 which both lines are above the weekly pivot point at 0.72990. The EMA of 10 is moving with bullish bias and it is located above the EMA of 100 and the EMA of 200. The RSI is falling towards the 50 level, the MACD indicator is in positive territory and the Stochastic is moving in high ranges. The ADX is showing a buy signal. The price is above the Ichimoku Cloud and below Chinkou Span. The Tenkan-sen is showing upward trend while the Kijun-sen is showing a horizontal trend. Despite the positive indicators showing upwards momentum, NZDUSD will probably touch the 0.72 area and then might continue its growth.